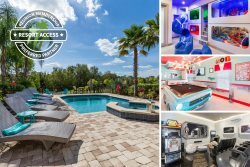 Whether you are needing an intimate getaway with the love of your life or your small family is long overdue for a vacation, our Reunion Vacation Homes one and two bedroom Orlando vacation condos offer the opportunity for the vacation of a lifetime without siphoning away your hard-earned dollars. We understand how hard you worked to save for your vacation fund and we also feel that you deserve to be spoiled. We love our guests and it shows in our Orlando vacation condos & homes. Its the little details that are so important and so ignored by other Orlando vacation rental property management companies that have our guests returning year after year. Bose sound systems, 50-inch flat screen televisions, and free Wi-Fi are just a few of the luxury extras you can expect from your Reunion Vacation Homes rental. Keep reading to learn what other amenities you will find in your vacation paradise! Even our smallest Orlando vacation condos offer the little extras you will learn to expect from your Reunion Vacation Homes condominium. Golf course views, plush carpet in the bedrooms, cool tiles in the hallways, and high-end appliances that are a joy to use are just some of what youll find in our exquisite homes. Preparing family dinners is no longer a chore, but a luxury! Living areas are large and bright, with the light of the cheerful Florida sun pouring through the oversized windows that offer unparalleled views of the beauty outside. Spend a rainy night watching movies on the extra-large flat-screened television in the living room or enjoy a cool, refreshing beverage on the covered patio as you watch one of Mother Natures most spectacular shows: a Florida sunset. The bedrooms of the Orlando vacation condos are tranquil spots, perfect for sleeping in after a long night out on the town. Heavy silk curtains can be pulled tightly shut to keep the light out while you sleep just a little longer. The bathrooms are spacious and spa-like, and soaking in a deep tub after a long day of sightseeing is an experience you will want to repeat time after time. Vacation life doesnt get much better than this! Escapology on International Drive in Orlando is just one of the fun activities our town has in store for you and your entourage. Groups of up to five people are locked away in a room and must solve the puzzles to earn the key to escape, leading to a few hours of hilarity. The Cuba Libre Restaurant & Rum Bar is just down the street, offering a unique place to celebrate your own liberation; try the Mojitos, they are out of this world!